The major troublespot is on 694 in the north metro. A rash of crashes has traffic creeping along between Hwy. 252 and 35W. The big one is a jackknifed semitrailer truck blocking two lanes on westbound 694 at Silver Lake Road. Adding to the misery for drivers are spinouts and crashes on the eastbound and westbound side at University Avenue. A vehicle is off to the right shoulder on westbound 694 at Central Avenue. And there's word of another wreck on eastbound 694 at East River Road. Driving on 169 is no picnic either. It's 30 minutes from 94 to the Crosstown on southbound 169 due to a crash near Hwy. 7. 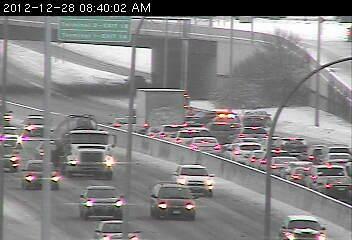 Northbound 169 is plagued with a wreck just before 494. Two lanes are blocked on eastbound 494 at 24th Avenue with a multi-vehicle accident.